Number 7 is my great-grandmother, Orella Turnbull, born in Bellaire, Belmont County, Ohio — across the river from Wheeling, West Virginia — in 1856. She married George Turnbull, born in England in 1857. 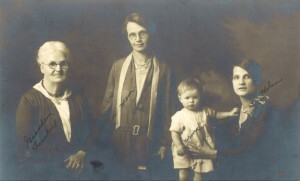 Their first child, Sylvia May Turnbull, was my grandmother. Orella — and her parentage — has been a bit elusive. Although I can find her in birth and death records for her children, I have located her in only two censuses. In 1880 she and George were in Bellaire with Sylvia and a second daughter, so she had already married and left home. Her parents, according to the census, were born in England. In 1900 Orella and George were in Duquesne, Pennsylvania, with Sylvia (now married to my grandfather), four other children — and a cousin, Albert Heatherington. Orella and George were likely first cousins. Her mother may have been married twice. One family name may have been Heatherington. Previously I’d focused on Albert, convinced that the Heatherington connection was the key. There are several Heatherington families from Bellaire — intriguingly, one with a daughter named “Oella” — and several Alberts, but nothing fell into place. Seated in my recliner, I looked at Dad’s notes again. What about that Jacob/Jack Abbott? With no idea if he was an older or younger half-brother, I searched for a Jacob Abbott who had lived in Ohio with a birthdate between 1840 and 1870. Up came a death certificate: Jacob Abbott, born in 1844, who died in Erie County, Ohio, a miner — consistent with sometime residence in Bellaire. Parents: Otis Abbott, born in New York, and Rebecca Harrington, born in England. Could Harrington really be Heatherington, I wondered? I searched for Rebecca Heatherington in Ohio. Up came another death certificate: for William Turnbull, a miner who died in 1936. Place of death: Bellaire. Sounding good. William’s parents: Rebecca Heatherington and James Turnbull. Sounding very good. With those clues in hand, I can now embark on further searches for Orella’s ancestry. Once again I learned the lesson of looking again at clues that were already in front of me. Jack Abbott’s name has been in my notes for at least fifteen years. Oh, and I haven’t even mentioned the breakthrough I had on Orella’s father, George Turnbull, also by looking again at something right in front of my nose! Very interesting article. I am in Erie County, Ohio, if I can be of assistance locally. I want to share a great regional resource in case you were not aware of it: http://www.rbhayes.org/hayes/ (Records and Collections & Obituary Index). Penny, this is so much fun! We may be cousins, I’m from the line of Kinchens. We followed Samuel K. Turnbull and son John from Green County, Ohio about 1850’s.